Be sure you have read the Intro page first! PBL21 - the next step in the evolution of project-based learning will take you through a process from identifying and articulating what a 21st century classroom looks and feels like to the development of your final product - a framework for a Project-Based, 21st century curriculum unit designed for your classroom, school or district. Watch student motivation, attendance, learning and test scores soar! Find out how to have your students excel on standardized tests without being just a test-prep factory. Project-Based, Real World, Relevant and Rigorous - Your unit design will include all the critical attributes of a 21st century classroom. It will be Project-based, Interdisciplinary, and provide Differentiated Instruction as well as Authentic, Performance-based Assessments. Your PBL21 curriculum will integrate 21st century skills, thinking tools, technologies and much more! Personalized Curriculum - Learn how to actually personalize learning for your students. Personalization is not about "adaptive curriculum", software programs guiding students through levels of basic skills. Those may be useful if implemented properly into your overall plan. True personalization of the curriculum means that the learning experiences will be aligned to and driven by each student's unique interests, talents, experiences, preferences and abilities. Find out how to do this for your students. This includes crating a new way of organizing your classroom and curriculum so that you have the time to truly facilitate. It is easy and so much more rewarding that lecturing, making and grading duplicate assignments for every student. Student Motivation - Students today live, learn and play in a media-saturated society, in a world of “infotainment” and spectacle. For many students the curriculum is not relevant, and they become disengaged from learning. Most students today enter a classroom designed for the 19th and 20th centuries, leaving their world of the 21st century behind. They will not be motivated, and in fact, this is why we have 7,000 students dropping out of school every day in the United States! In this workshop you will learn how to create a classroom and curriculum that is highly motivational, relevant, rigorous and real world. Your students will love school and will learn at the highest levels. Maintaining High Expectations - it's not an option! What are teachers really saying to students when they assign a grade of 43 or 57 or 74? "You do not have to learn this. You are not smart." That, in our book, is a crime. Our classroom motto is If It Isn't Good, It Isn't Done! Learn how to maintain the highest expectations for your students, how to motivate all your students, and how to support them in achieving these expectations. Media Literacy - Rapid developments in technology have brought many exciting changes to life in the new millennium, presenting new challenges for schools. Multiple new literacies are required to navigate the “forest of signs and symbols” of our globalized media culture. (Douglas Kellner, UCLA) Even the CCSS state that media literacy skills must be infused throughout the curriculum. You will learn how to incorporate elements into your project that develop these critical skills for accessing, analyzing, evaluating and creating media messages. 7 Survival Skills for the 21st Century - these 7 skills were articulated by Harvard Professor, Tony Wagner, in his book The Global Achievement Gap: Why Even Our Best Schools Don't Teach the New Survival Skills Our Children Need - And What We Can Do About It. The curriculum you design will teach these 7 Survival Skills. Your kids will not only survive, but will thrive! Multiple Literacies - life in the 21st century means that the 3R's are insufficient. Learn 10 essential literacies required for success in the 21st century, and then learn how to support their development in the curriculum you design. The Global Classroom- Global Competence is the capacity and disposition to understand and act on issues of global significance. Addressing issues of global significance — around the world or in students’ own backyards — is essential to a world-class education. We live in an interconnected world, and today’s schools must prepare students to participate, interact, and thrive in it — and to improve it. Global Competence can be developed within any discipline, and it can cut across disciplines. Learn how to design a curriculum that helps your students develop critical Global Competencies. Standardized testing mania has made meaningful curriculum an endangered species. Find out why it's not an "either-or" situation - you can still teach the way you know you should and your kids will excel on their standardized tests! Read the research! Plugging In! 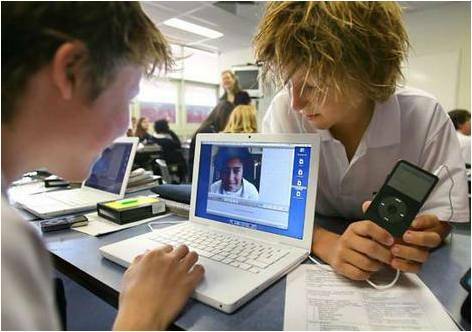 - Technologies and Multimedia - utilize these 21st century tools as the vehicles to implement your curriculum! (Note: this is not a workshop that centers on educational technologies, but centers on curriculum design which incorporates, or utilizes as a vehicle, these technologies in order to achieve curriculum and instruction aligned to the realities of the 21st century.) Many teachers treat these wonderful new tools as simply very expensive, electronic forms of the old paper and pencil. Find out how these technologies serve as a vehicle for taking your PBL to new heights of learning and student motivation. Content Standards and the Common Core - we listed this last because it is a given! We will facilitate your process of brainstorming possibilities for a powerful unit of curriculum which not only teaches all the standards, but goes far beyond! And it's actually much easier, not to mention much more rewarding, than trying to "cover the content" as quickly as possible. Don't have your students spending all their time running from one subject area to the next, running on the memorizing and testing treadmill. Teaching is not about throwing out information, and learning is not about memorizing, testing and forgetting. In this workshop we will address these issues, and more, as you . . .
Transform your classroom into one that is truly Student-Centered (plan the project - preferably with the students - set them in motion, support them fully and GET OUT OF THEIR WAY! They will achieve far more than you think! Designing the 21st Century Classroom - about the workshop . . .
Design a curriculum that goes far beyond the CCSS - and painlessly for you and the students. Remember, the standards are a statement of the floor - the minimum to be learned! Few workshops include snack breaks! See full menu on the Venue Page! You can pay our price or more for professional development workshops that don't even provide morning coffee. We make great efforts to treat you special, like the professional you are, and you deserve luxury treatment - see our Whole Teacher philosophy! Can’t attend this workshop? This workshop is available as an online course, university accredited! Or we can bring it to you! That way your entire faculty can experience the professional development first-hand. Now is the time to reserve your dates for on-site professional staff development at your campus or district. We can bring you one of our workshops, or we can work with you to develop a unique professional development plan tailored to the needs and goals of your unique district, community or country! Contact 21st Century Schools to discuss your needs for the upcoming school year and to reserve your preferred dates. Call (254) 206-1744 or email us.